Former Levi Strauss president replaces Henry Juszkiewicz as head of guitar giant. The hiring of the new leadership team follows the departure of embattled former CEO Henry Juszkiewicz, who departed the company earlier this month as part of the company's post-bankruptcy restructuring plan. 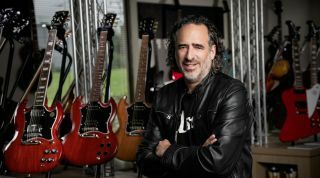 “As a business leader and a brand builder, this is the beginning of a new era for Gibson that will build on its proven heritage and iconic status," Curleigh continued. "We are focusing on the future and off to a fresh start, with a strong financial foundation, a committed and experienced new leadership team and new ownership that is equally passionate about the brand. Gibson—which was founded in 1894, and sells over 170,000 guitars annually in 80 countries—filed for bankruptcy in May, after the company's unsuccessful expansion into the consumer electronics business left it almost $500 million in debt.